With one of the highest ratio’s of cafe’s to people in the world, Maastricht will provide you with plenty of locations to work from. Whether you like a trendy new bar with funky music or a more cozy feeling; there is plenty of options. 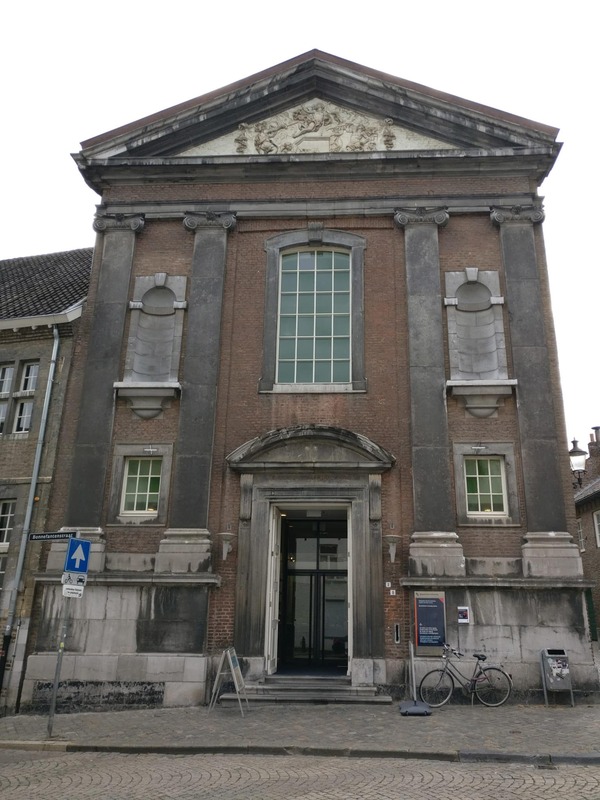 Maastricht has a high student ratio (about 10%) with many international students. Almost everyone speaks English and it is easy to get around by foot or bike. Prices in Maastricht are comparable to most of the Netherlands, but it is cheaper compared to the big cities like Amsterdam or Rotterdam. 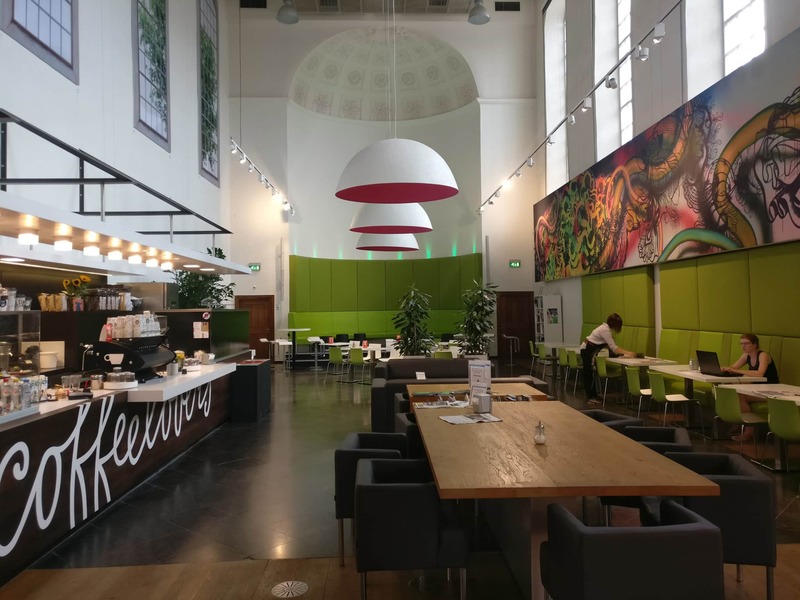 The large student population also comes with many student cafes, which have lower prices. 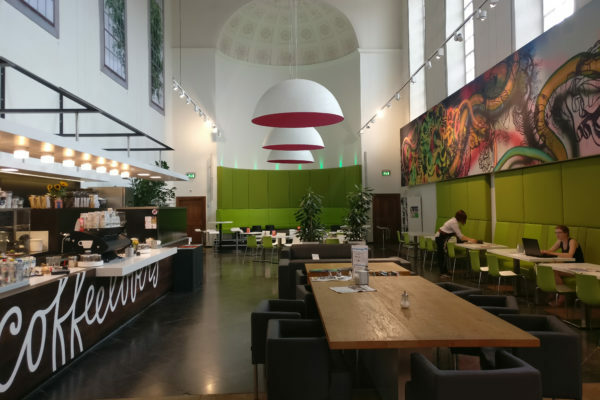 If you rather not mingle with students or prefer more co-working style there are some cafes offering exactly that. 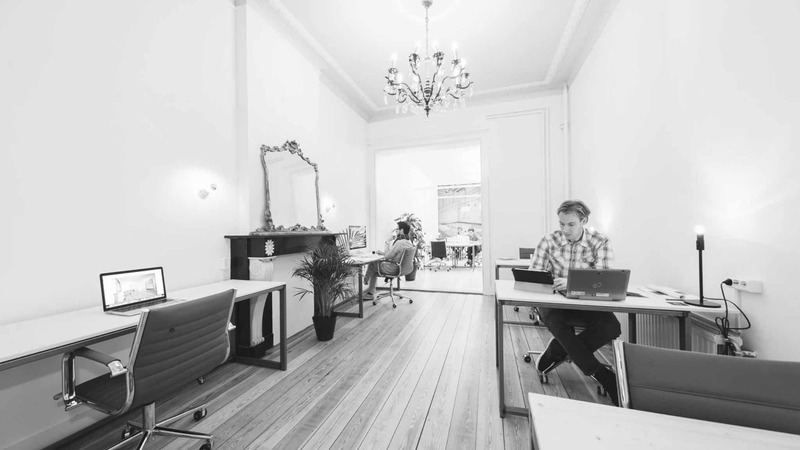 The 10 best free Co-working spaces in Maastricht are listed below. The list is randomly chosen and does not represent any ranking. Each cafe has a final score if you are in a hurry, or you can read the complete description to find the co-working that fits your style. 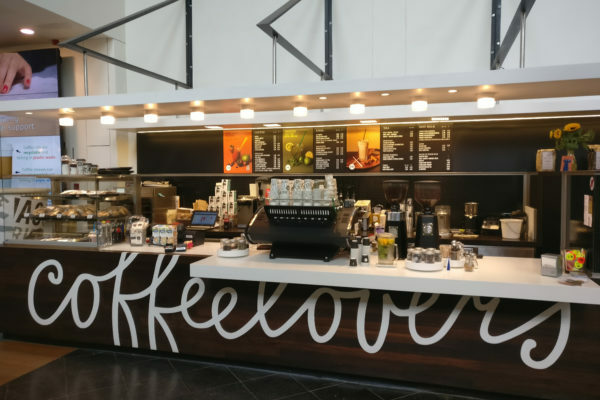 Located in a side street of the city center, this great looking coffee bar provides plenty of tables, power plugs and above all great coffee. Prices are very reasonable and on the cheap side Maastricht. The WiFi is decent, but don’t expect crazy high internet speeds. The bar seems to be run by two passionate owners who are happy to have a chat. The bar is quite stretched which offers many places to sit in private. The laptops often move towards the back, creating a tiny co-working island around the wooden tables. You can choose to join the larger table, or take your own private table if you prefer. There is natural daylight coming in from both sides. The wooden desks are at comfortable height, suitable for most people. The chairs provide some back support but might start feeling quite hard after several hours of working. You can always go for a walk in the park (just around the corner) or stretch your legs in the city center. Order your coffee at the bar and they will bring it to your table. The plus side of this system is that you can work very comfortable without having the feeling to ‘ have to order again’ . This lets you stay in the flow and work till you finish. If you get hungry there are well priced snacks to get you through the day. Friendly service and smiles if you walk in. The noise level is very reasonable. There is some soft playing music, often classical piano or lounge. There are many people working on laptops and in general people tend to keep their voices down due the co-working atmosphere. If you want to have a louder chat you can usually move to the front of the bar to have a call or chat. When doing an internet speedtest (about 10 people present) I got 12.6mbps download and 7.80 mbps upload. This is plenty to do most of your work, including blogging, skype and some up and downloading. If you need to download or upload many files you might wanna go somewhere else, but in general this will work for most people. A cross-over between University and cafe, this bright colored coffee bar is a mix of students and young professionals. 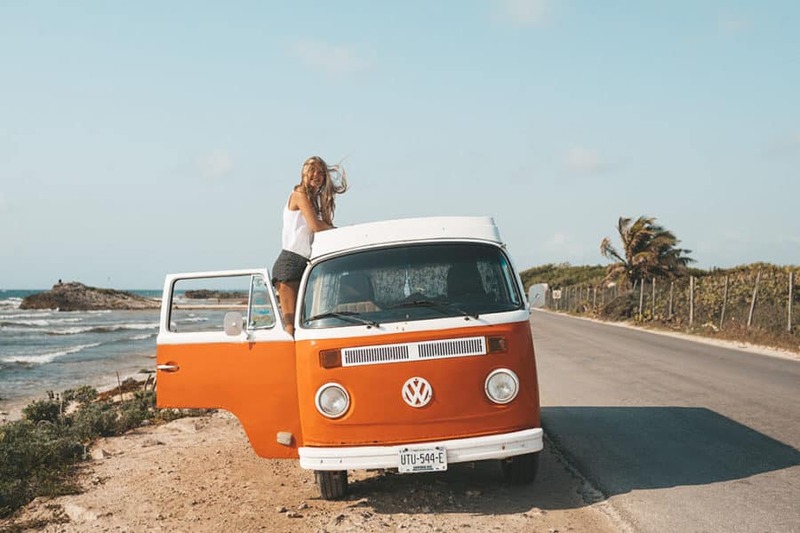 You might not find too many Digital Nomads or coworkers here, but if you like a young crowd and some energy this might be right for you. You can choose to sit on one of the bright green couches, or sit down at the desk with chair. 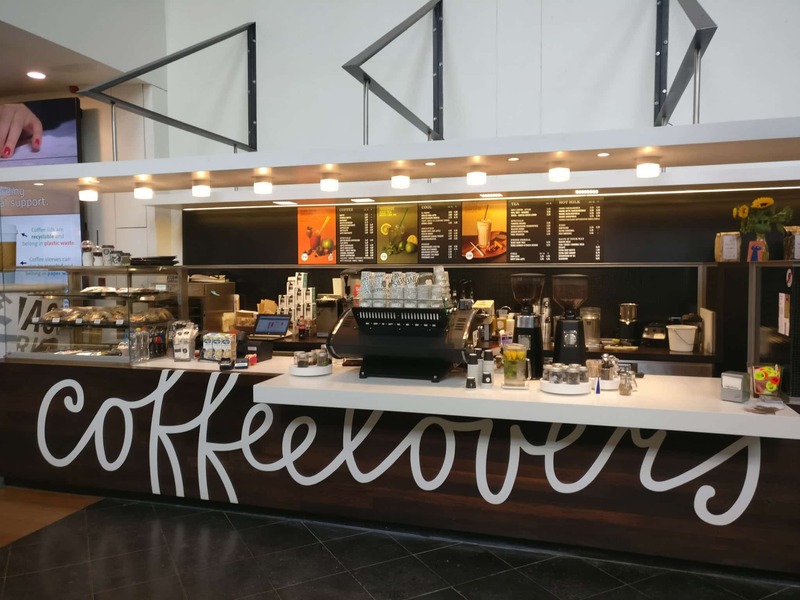 Coffee Lovers is known for its great coffee (what did you expect…). They are relatively expensive but the quality is good and made with Love. A big downside for me is that they only offer drinks in take away cups! Even if you sit down, you will get a take away cup. I only go when I have my own cup with me, as I refuse to use take-away cups, especially when sitting down. If you like to work more quiet you can move upstairs to the dedicated co-learning spaces, meant for (PhD) students but open to everyone. This area has less atmosphere, but provides quite and private co-working desks for free. 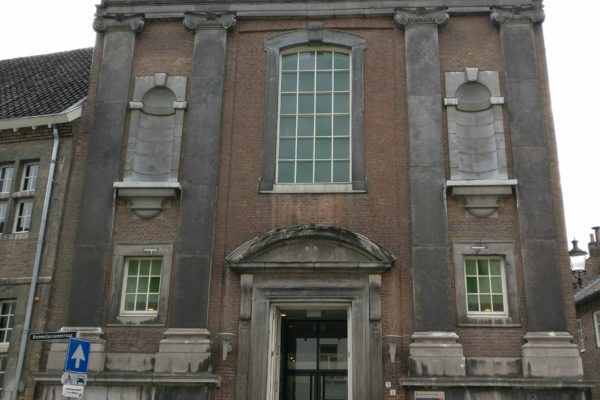 Note that during summer Maastricht University will be at very low capacity, with many international students visiting family over summer. This means most student places will be notable quiet, so decide accordingly. As I like a quiet and relax atmosphere summer is the perfect time for me to visit these places. When University starts, especially during exams, these places can get quite packed. Note that the building closes at 18:00 on most nights. How I would imagine Google Campus. The Student Hotel Maastricht offers a slide to bring you downstairs, a rooftop bar with views over Maastricht and a large net o lay back in and watch some TED movies. 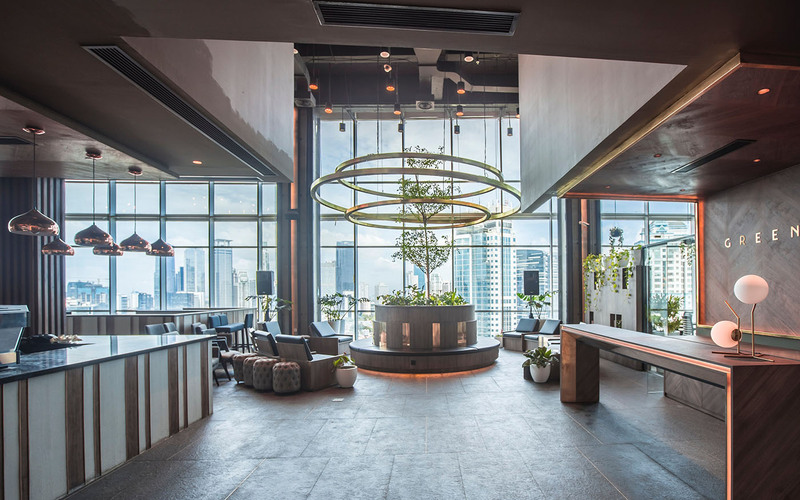 The Student Hotel (TSH) is a mix of modern design with industrial architecture, full with funny details and interesting spots. You will find couches to lay in, a net to hang in, tables to work at and even a gym if you feel like blowing off some steam. TSH is located in the old Sphinx building, an industrial area with high ceilings, open metal frames and a rough looking outside. The inside has been completely renovated and offers a colorful interior with comfortable seats and a great energy. 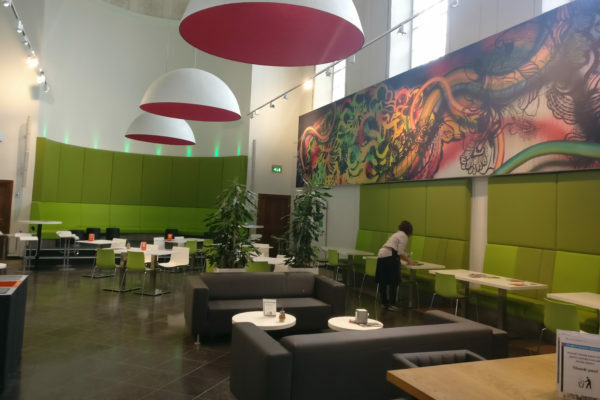 You can grab a coffee from the bar and make yourself at home, or sit in their seperate Restaurant area if you are up for a snack. The internet is good and will get you going in no time, no password needed. Using google Speedtest I get 32.9 Mbps download and 8.05 Mbps upload. Located in an old military base, this wide open space offers something different. The Tapijn Area has been completely renovated over the last few years, and what used to house soldiers has now become a trendy area with a beautiful park, plenty of open space, a vegetable garden, some free-roaming animals and a great cafe. The cafe is called ” Tapijn Brasserie” and offers both an inside and outside area. If you look around you will find elements of the old military buildings, but you will also smell freshly grind coffee, couches to relax in or tables to work from. The high roof and large open space give it a feeling of freedom and space. 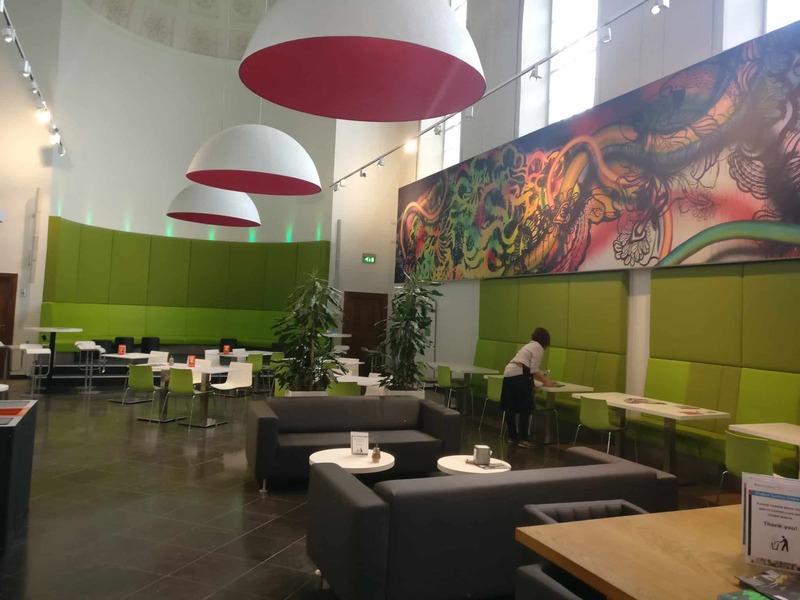 The outside area offers plenty of shades spots but might be less suited for work, as nice weather will usually bring people in that are stopping for a drink. The inside however is great to do some work. The coffee is good, the wifi is stable and the staff is friendly. The drinks are very reasonable priced although the food is a bit more expensive. The public library open to everyone, but offering over a hundred workspaces all around the building. Desks vary from a simple desk with chair to private rooms and a sort of tiny house approach. During exams this place can be busy with students as well so make sure to be there on time of make a reservation for one of the rooms. As there are limited power plugs bring your own extension to keep going all day long. There is a good coffee bar right inside the library where you can enjoy a coffee and a snack. Or if you fancy there is a supermarket right across the beautiful square. Stretch your legs with a walk along the river and enjoy a local gelato. Internet is good and if quiet can be really fast. Not your usual blend; a mixture of a coffee shop with a bike repair shop. I am not sure how this evolved but it worked out really well. They describe it themselves as a social hub and workspace, where coffee and a passion for bikes are fused into a creative space. Neither being a bike shop nor a coffee shop, but excelling at both. With specialty brewing methods and superior espressos thanks to their local collaboration their coffees are close to perfection. I actually have not yet had the change to work here, so will update it once I have sat down with my laptop for some longer time. A designated co-working space right outside the Student Hotel. For people who like to have a designated desk or prefer to have their own space, the TSH collab is one step up from the regular TSH. You will get unlimited coffee and prints. Access is dependent on your membership but some memberships allow 24/7 access. Memberships range from €99,- per month up to €230,-. The 99 euro one is the flex membership. This will allow you to sit at any space in the flex-working area. Please note that at the moment of writing this area does NOT provide ergonomic seats and desks as you might expect. It is a variety of plastic chairs and couches that are fine for a few hours, but might not be what you are looking for if you wanna clock in more hours. The 230 euro will get you a dedicated desk, where you can leave your stuff and make your own. Put a monitor on your screen, store your valuables in the locker. The premium desks are located at the window and give you plenty of daylight and a beautiful view. By signing up for TSH Collab you will get tons of extra’s, like discount in the Collab Restaurant, a free rental bike and acces to the gym. Not bad for a membership starting at 99 per month. Things get a little bit confusing, as Collective Workspace Maastricht (CWM) and TSH Collab are working together. If I understood things right TSH Collab has moved into Maastricht, while it allows CWM to manage their spaces. 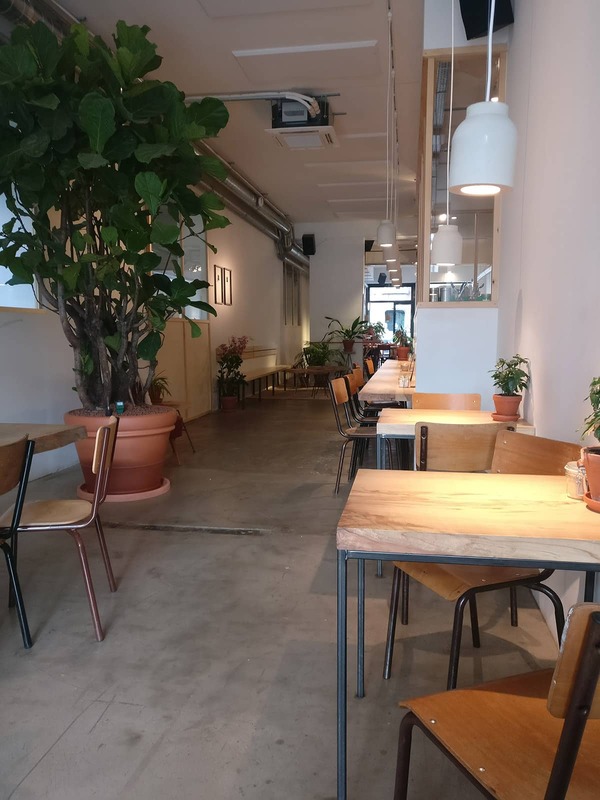 Anyhow, besides the confusion, this Co-working space in the middle of Maastricht offers a cozy working area. Located in an historical building this charming looking space offers wooden desk for coworkers. Comfortable chairs and and a little outside area will keep you going throughout the day. Compared to TSH Collab this workspace is much more intimate. There is about 16 desks, whereas TSH Collab probably has space for over 100 people. Prices started at €175 per month for your own desk with 7 days access. If you are looking for a strong community feeling this place will get you going straight away. The small space will make interaction much easier which results in closer relationships with your co-working colleagues. As TSB Collab and Collective Workspace Maastricht are collaborating you will enjoy the same perks as with the prior one. This means Free Coffee, meeting rooms, free printing, free gym membership, several discounts and a soundproof phonebooth.